Cameras, phones, GPS devices — we all know about those. But did you know that your smartphone can replace a wide range of esoteric tools and devices? 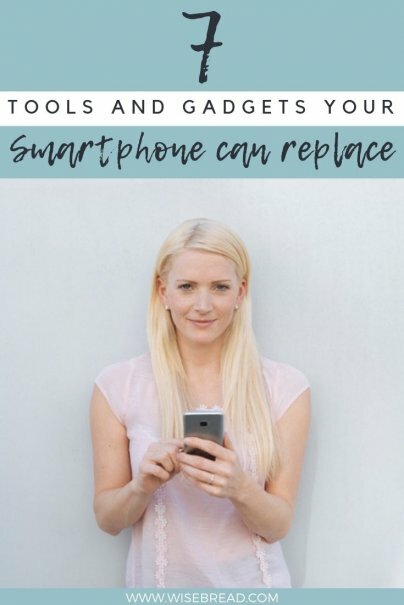 From the scientific calculator to the credit card reader to the remote control, here is a list of tools and gadgets you can replace with your smartphone. This is where Photomath comes in, allowing you to snap a pic of virtually any type of math problem. The app then solves that problem for you, and showing you step-by-step instructions. Think of this app as one of those bulky Texas Instruments calculators on steroids! And the best part is that downloading the app is free. It's Saturday, you just got that $600 check that you've been waiting for, and there's no way you can get to the bank before closing time. You also have no clue how close the next ATM that accepts check deposits is. Instead, you could endorse your check, add a note "for mobile deposit only," snap a pic of it, and receive up to $200 the next business day. As early as 2009, many banks around the country have issued a smartphone app that allows account holders to do mobile check deposits. Most financial institutions make the first $200 of a mobile check deposit available for withdrawal the next business day, and the rest of the funds available on the second or third day for withdrawal. Contact your financial institution for more details and applicable rules. Drafty windows are one of the sneaky home money pits that sap your savings. Hiring a contractor to check this out for you can cost you hundreds before even starting to fix the problem. The Flir One Thermal Imager is a device that turns your smartphone into a thermal imaging camera, allowing you to find drafty windows and other poorly insulated spots. While you'll have to invest about $250 in a Flir One Thermal Imager, you can quickly make back that money by lowering your energy bill by up to 10% per year and taking advantage of rebates and special offers from Energy Star products used in your insulation projects. Since about 40% of Americans carry less under $20 in cash on them and 9% of them carry no cash at all, you shouldn't be surprised that it is even harder nowadays to get your friends and relatives to pay you back that $15 they owe you. But you do know that your debtors have a debit or credit card laying around! So, leverage a credit card reader from PayPal or Square and start accepting card payments on your smartphone. While the two companies mail you the first credit card reader for free, PayPal and Square charge 2.7% and 2.75% per U.S. debit or credit card swipe, respectively. Paying up to $0.41 for having your $15 today instead of in two months isn't a bad deal at all. Got no Internet connection? No problem, Square's app allows you to collect payment as long as you reconnect to the web within 72 hours from the time of the card swipe. As cars are becoming smarter, they all provide much more information than you think. With the Automatic Pro, you can connect to just about any car's standard diagnostics (OBD-II) port and unlock the data in your car's onboard computer. Most cars manufactured since 1996 have this port and are compatible with the Automatic Pro (here's the full list). By investing about $130, you'll become a "car whisperer" and pay zero fees for unlimited monitoring. As a bonus, the Automatic Pro connects to many apps, such as Expensify and Freshbooks for invoicing mileage driven. How many times have you needed a level to hang a frame, mount a TV, or adjust the height of a table? A bubble level can cost you anywhere from $5 to $50 at your local or big box hardware store. Not to mention that you have to drive there, stand in line, and drive back, delaying your start time by up to a couple of hours to start that home project. Instead, you could download a free level smartphone app, such as Bubble Level for Android devices or iHandy Carpenter for Apple devices, and get to work right away. At my home, we used to have a separate remote for the DVD player, the TV, the cable box, and the air conditioner. That was until we discovered that a smartphone can connect to many electronics and home appliances through its built-in infrared (IR) blaster. While there are many universal remote controller apps out there, Peel gets top marks because it connects your smartphone to TVs, set-top boxes, DVD players, entertainment portals such as Roku and Apple TV, audio systems, and home appliances such as air conditioners and heaters. You can download Peel for free, but you may need to purchase the Pronto 360-degree IR blaster, depending on the connectivity options of devices that you want to control.